Woven Green Soundscapes are designed to restore resonance in mind, body, and spirit. Using specific sound frequencies, each track guides the listener into theta brainwave states, which are proven to help reduce stress, awaken intuition, enhance creativity and promote an overall expanded state of consciousness and well-being. Soundscapes include various flutes, quartz crystal and Tibetan singing bowls, stringed instruments, nature sounds, vocal toning, native drumming, percussion, crystal pyramids, and ambient keyboards. ABOUT WOVEN GREEN Jim & Ashley Cash are a married couple that have devoted their lives to writing and performing the music of Woven Green. 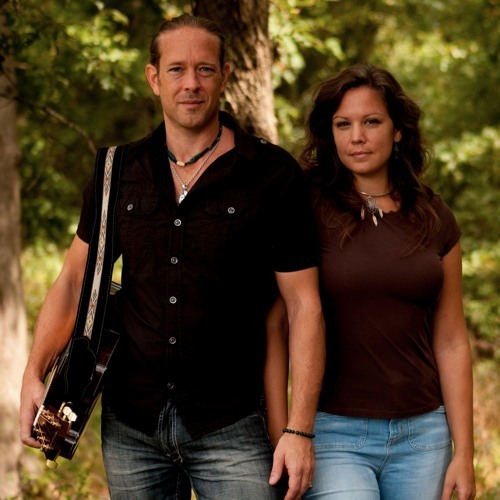 Jim is a prolific songwriter and a strikingly versatile guitarist and multi-instrumentalist, his wife a powerful and captivating singer, guitarist, and percussionist. Together, the two create a magical alchemy that is truly uplifting and inspiring. Their music ranges from contemporary folk-rock singer-songwriter to ambient soundscape journeys using a combination of their own field recorded nature sounds, Native American flutes, singing bowls, percussion, and various stringed instruments. Their partnership, music, and message is sure to empower and entertain! Jim and Ashley are often joined by their good friend, percussionist, and drum circle facilitator, DRUM DANIEL.